A Hawaiian Airlines Airbus A330 takes off for Honolulu from Los Angeles International Airport on Sept. 23, 2017. Hawaiian Airlines will add Boston to its route map, launching nonstop service to Honolulu in a route the carrier says will become the USA’s longest regularly scheduled domestic route in history. The Honolulu (HNL) flights launch April 4, which Hawaiian spins as “timed to offer winter-weary New Englanders a vacation” to Hawaii’s tropical climate. 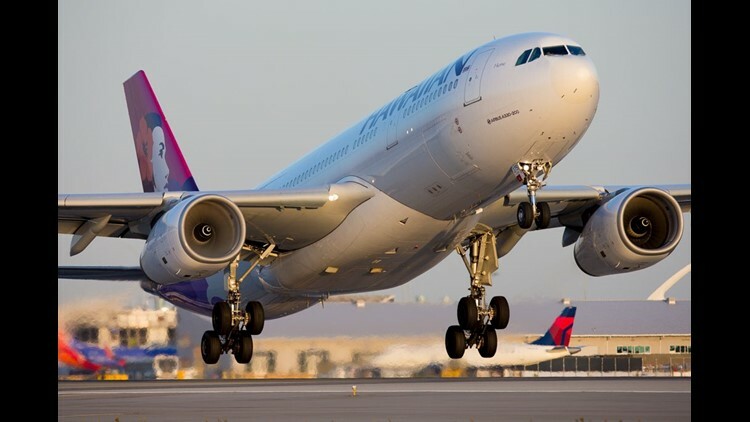 The carrier will offer five flights a week on Airbus A330 widebody jets that include lie-flat seats in business class. “Honolulu will be (Boston) Logan’s 76th nonstop domestic destination, and with New Englanders coming off a long winter this flight’s start date is worth the wait,” Thomas Glynn, CEO of the Massport agency that operates Boston’s Logan International Airport, says in a statement. Boston had been the largest U.S. market without a nonstop link to Hawaii, according to Hawaiian. This uniform is among the new designs for Hawaiian Airlines' flight attendants. This uniform will be among the new options for Hawaiian Airlines' flight attendants and airport customer service workers. A new airport customer service uniform is seen on the man to the right while a new flight attendant uniform is seen in the worker (left) walking away. Hawaiian Airlines' flight attendants and airport customer service workers will be among those to wear these new uniforms. Hawaiian Airlines' new uniforms for its cargo workers. Hawaiian Airlines' new uniforms for its maintenance and supply workers. Hawaiian Airlines' new uniforms for its line services workers. Hawaiian Airlines CEO Mark Dunkerley (left) walks with a flight attendant at a company fashion show unveiling uniforms for about 5,000 frontline workers. Hawaiian Airlines' employees perform a traditional oli (chant) with designer Sig Zane at a company fashion show unveiling uniforms for about 5,000 frontline workers. Hawaiian Airlines CEO Mark Dunkerely (center) is seen between Kuhao Zane (left) and Sig Zane (right) from the firm that helped design the new uniforms. “At 5,095 miles, Hawaiian’s BOS-HNL route becomes the longest regularly scheduled domestic route in U.S. history,” the airline adds. The route will overtake the current record-holder, Hawaiian's existing New York JFK-Honolulu route. Flight time from Boston is listed at 11 hours, 40 minutes westbound. The return is 10 hours, 15 minutes. Connections to Hawaii’s other islands are available via Hawaiian’s Honolulu hub. For Hawaiian, Boston becomes the airline’s second city along the U.S. East Coast. It already flies from New York JFK. The only other nonstops currently connecting the East Coast to Hawaii are on United (from Newark and Washington Dulles) and Delta (from Atlanta). “There is nowhere on Earth like Hawaii, and we are bringing our islands closer than ever to Boston with nonstop service,” Hawaiian Airlines CEO Peter Ingram said in a statement announcing the service. Hawaiian Airlines Boeing 717 jets park at the inter-island terminal at Honolulu International Airport on Nov. 8, 2017. An Aer Lingus Boeing 757-200 lands at Boston Logan International Airport on Nov. 25, 2017. A make-up artist applies make-up to a United Airlines flight attendant dressed in a retro 1970s-themed uniform before taking part in the final Boeing 747 flight for the airline on Nov. 7, 2017. Mechanic Ron Lostica poses for a photo onboard United Airlines' last Boeing 747 jet before it made its final passenger flight on Nov. 7, 2017. Mr. Lostica, a 31-year United veteran, wore a Boeing 747 hat from a delivery in the 1990s. A Spirit Airlines Airbus A320 departs Boston Logan International Airport on Nov. 25, 2017. Lufthansa's retro-painted Boeing 747-8i lands at Seattle-Tacoma International Airport in December 2017. A JetBlue Embraer E190 lands at Worcester Regional Airport in central Massachusetts on Nov. 24, 2017. Sean Worsley and Christine Ellis embrace after Mr. Worsley asked Ms. Ellis to marry him aboard United Airlines last Boeing 747 passenger flight on Nov. 7, 2017. She said yes. A cabin crew member aboard United Airlines last Boeing 747 flight takes the 1970s retro-theme to heart on Nov. 7, 2017. United Airlines flight 747 takes off from San Francisco International Airport as it travels to Honolulu on its final passenger flight on Nov. 7, 2017. An Aeromexico jet sits on the tarmac at Mexico City's international airport on Nov. 28, 2017. A Horizon-operated Embraer E170 jet, flying for Alaska Airlines, lands at Seattle-Tacoma International Airport in December 2017. A Hainan Airlines Boeing 787 Dreamliner departs Boston Logan International Airport on Nov. 25, 2017. A Southwest Airlines Boeing 737 MAX 8 jet lands at Seattle-Tacoma International Airport in December of 2017. United Airlines last Boeing 747 rests at the gate in Honolulu, HI after completing its final passenger flight on Nov. 7, 2017. United Airlines flight attendants dress in 1970's retro uniforms aboard the carrier's last Boeing 747 passenger flight on Nov. 7, 2017. A passenger aboard United Airlines last Boeing 747 flight poses for a portrait on Nov. 7, 2017. A flight of Australian low-cost carrier JetStar taxis at Sydney's Kingsford Smith International Airpor on Nov. 27, 2017. An Airbus A320 aircraft with the logo and colours of Joon - the new lower-cost airline subsidiary of Air France - moves at the Charles de Gaulle Airport on Nov. 30, 2017. The airline debuted service on Dec. 1. A United Airlines Boeing 737 departs over an arriving Spirit Airlines Airbus A319 at Boston Logan International Airport on November 25, 2017. Crews work to de-ice jets during an unexpectedly strong snow storm at Atlanta-Hartsfield International Airport on Dec. 8, 2017. Ryan and Jennifer Herrscher of Dallas enjoy the unique upper deck of the Boeing 747 aboard United Airlines last flight of the jet on Nov. 7, 2017. An American Airlines Airbus A321 lands at Boston Logan International Airport on Nov. 25, 2017. A Delta Air Lines Airbus A319 departs Boston Logan International Airport on Nov. 25, 2017. A Delta Air Lines MD-88 gathers snow at the beginning of a winter storm at Atlanta-Hartsfield International Airport on Dec. 8, 2017. A passenger aboard United Airlines last Boeing 747 flight poses for a portrait on November 7, 2017. A cabin crew member aboard United Airlines last Boeing 747 flight prepares meals for passengers mid-way through the flight on Nov. 7, 2017. This photo from May 27, 2015, shows American Airlines jets at Miami International Airport. A Delta Air Lines Airbus A321 departs Boston Logan International Airport on Nov. 25, 2017. A Horizon-operated Bombardier Q400, flying for Alaska Airlines, departs Seattle-Tacoma International Airport in December 2017. Singapore Airlines' new Airbus A380, which is configured with the carrier's luxurious new first-class suites, arrives to Singapore's Changi Airport on Dec. 14, 2017. A Delta Air Lines Boeing 757-200 taxis out to depart from Atlanta-Hartsfield International Airport on Dec. 8, 2017. An Airbus A320 painted in the colors Joon, the new airline subsidiary of Air France are soon on the apron at the Paris Charles de Gaulle Airport on Nov. 30, 2017. The airline debuted service on Dec. 1. A Delta Air Lines Boeing 757-200 departs Seattle-Tacoma International Airport in December 2017. A Southwest Airlines Boeing 737 MAX 8 jet lands at Seattle-Tacoma International Airport in December 2017. Cardinals wave goodbye to a Bangladesh Airlines aircraft In Dhaka carrying Pope Francis after his three-day visit to Bangladesh on Dec. 2, 2017. This photo from Dec. 11, 2017 shows an ASL Airlines Europe Airpost airplane and Brussels Airlines airplane on the snowy tarmac of Brussels Airport. The sun casts a nice light on a new Singapore Airlines Airbus A380 ahead of a formal delivery ceremony on Dec. 13, 2017. A new Airbus A380 Singapore Airlines plane takes off from Airbus' delivery center near Toulouse, France, on Dec. 13, 2017. United Airlines' last Boeing 747 is shown before its final passenger flight on Nov. 7, 2017. The airline is retiring the iconic jet after 47 years of service. Passengers check in for United Airlines' special Boeing 747 send-off flight from San Francisco to Honolulu on Nov. 7, 2017. A flight board at San Francisco International Airport shows United Airlines' Flight 747 to Honolulu on Nov. 7, 2017. Passenger Henry Harteveldt adjusts his custom United Airlines jet tie prior to boarding the airline's last Boeing 747 flight on Nov. 7, 2017. Passengers snap photos of themselves in front of a banner sending off the United Airlines Boeing 747 at San Francisco International Airport on Nov. 7, 2017. “I had to be here,” said passenger John Vanderford, shown here on the right, as he partied with other Flight 747 customers prior to boarding. “It’s the last 747 flight. I remember flying it as a kid, on this exact route — San Francisco to Honolulu." A United Airlines flight attendant has her makeup done prior to United Airlines' last Boeing 747 flight on Nov. 7, 2017. A United Airlines flight attendant has her hair done prior to United Airlines' last Boeing 747 flight on Nov. 7, 2017. United Airlines flight attendants Thu-ha Nguyen, left, and Jamie Chin take a selfie before boarding United Airlines' last Boeing 747 flight on Nov. 7, 2017, in San Francisco. United Airlines flight attendants have their hair and makeup done prior to United Airlines' last Boeing 747 flight on Nov. 7, 2017. Passengers Dominic and Monica Fabian of San Francisco pose in front of a banner sending off the United Airlines Boeing 747 at San Francisco International Airport on Nov. 7, 2017. A passenger holds a special plaque commemorating several other first and last flights he's done over the years before boarding United AIrlines' last Boeing 747 flight on Nov. 7, 2017. Kevin Weber hands out custom-made Boeing 747 pins, featuring United liveries over the decades, before the airline's last Boeing 747 flight on Nov. 7, 2017. A United Airlines ticket agent poses with special tickets and ticket jackets printed for the airline's last Boeing 747 flight. Gift bags rest on the chairs of the last United Airlines Boeing 747 before its final flight on Nov. 7, 2017. United rolled out a “throwback” theme for the flight. Crews donned 1970s retro uniforms and customers were offered items from a “1970s-inspired” menu. A passenger on United’s final 747 flight takes the retro theme seriously, right down to a fake cigarette. It’s easy to forget smoking was allowed on planes. The unique four-engine throttle aboard the last United Airlines Boeing 747 on Nov. 7, 2017. United Airlines CEO Oscar Munoz poses for portraits aboard the carrier's last Boeing 747 flight on Nov. 7, 2017 in San Francisco. The airline is retiring the iconic jet after 47 years. Mechanic Ron Lostica, a 31-year United Airlines veteran, poses for a photo aboard the last United Airlines Boeing 747 before its final passenger flight on Nov. 7, 2017.